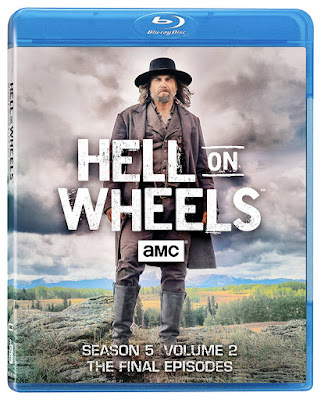 There are two ways to approach the review of the second volume of the fifth and final season of “Hell on Wheels.” I could review the content itself, which would be nothing but high praise for the emotional resonance of these final episodes. Unfortunately, the release plan for the last season has not been nearly as admirable as the content. Rather than waiting to release the entire final season together, they split it up into two separate packages with only 7 episodes in each. Considering the cost of each release, it is difficult not to see this as a direct insult to the fans. Monetary reasons aside, I wish that the second half of season 5 had been paired with the first, if only for balance. The first half of the last season was fairly unimpressive, whereas the second half returned the show to its form. For the entire show’s run we have followed Cullen Bohannon (Anson Mount), outlaw out for revenge turned railroad man. Since the pilot introduced us to the broken man, we have watched him endure endless loss and hardship. These final episodes begin with an assault that leaves our protagonist limping through the remainder of the show. All of the emotional turmoil from the last five seasons builds to an unbearable roar by the final episode, giving the last moments in this series full of viscously realistic depictions of American history added resonance. The main storyline of “Hell on Wheels” has always been the construction of the first transcontinental railroad in the United States, giving the series a natural ending. With the completion of the railroad looming in the final episodes, it becomes about the race to the finish line between the Central Pacific Railroad and the Union Pacific Railroad. Ultimately, this is about pride more than anything, and Thomas Durant (Colm Meaney) is determined not to let Bohannon beat him since leaving to work for the Central Pacific. The Central Pacific provided a number of new characters to the final season of the show, some better than others. Among them is a love interest (Angela Zhou) for Bohannon amidst the Chinese workers hired to counter the black workers on Union Pacific’s line. There is also a new villain for Bohannon to face in Chang (Byron Mann), the ruthless pimp in charge of the Chinese work force. Before Bohannon can face either Durant in the race to the end of the line or Chang in battle, however, he must first resolve a longstanding feud with longtime villain, Thor Gundersen (Christopher Heyerdahl). All of this happens in these final seven episodes, which makes the first half of the season feel like the third Hunger Games movie. The last 7 episodes are fit onto two Blu-ray discs, along with special features. The extras include a brief look at the last episodes, which reads like a promotional featurette the way it avoids spoilers. There is also individual featurettes looking at the making of each episode, none of which are much more than 5 minutes in length. “Golden Spike” is a featurette just over a minute long about the actual historical significance of the narrative, and the last extra is a touching featurette with the cast sharing memories from the production.